No matter what the season, there’s nothing better than spending some quality time outdoors with your family. One of the best ways to enjoy time in your backyard is beginning a project. Not only will the whole family love getting involved, but you can also save a lot of money by working on things yourself. Here’s just five fun ways to add something nice to your backyard. Every backyard needs an attractive, even slab of concrete. If you plan to do any outdoor events like barbequing, it is downright essential, as a hot grill can become dangerous on uneven terrain. If you have an old concrete slab you’d like to refurbish, there’s plenty of options for improving it. A cheap but effective method is to place pavers or bricks on top of the existing concrete slab. This can level the surface as well as making it more pleasing to the eye. It will be much cheaper too! Feel cramped and claustrophobic in your own home? Why not make one outdoors? Outdoor rooms can be a fantastic place to get away from anything, and they don’t have to be too expensive. A simple wood house, decorated with some trimmed hedges and flowers, will give you the privacy you need. You can put an old couch and curtains in the window to transform it into a cool hangout for your kids; you can also use it as a workshop for future projects. Decorating your backyard with lights can give it an otherworldly beauty, and the best way to do it is with solar powered lights. You can pick up some pretty cheap fixtures, but if you’re looking for solar power that lasts, consider investing a little more. These will last you a good ten years and cover your yard in bright light. In the long run, you’ll save on your energy bill, plus there’s the added benefit of home security. Here’s an idea that the kids will absolutely love. Building a fun outdoor area, like a horseshoe pit, can be an inexpensive way to spice up your backyard. If you’re looking for something a little more high-brow, you can install a stone chess board. With a bit of free material found around the area or online, these kinds of installations can be very practical. It might take a bit more work, but a pond can make your backyard incredibly eye-catching. Check out http://www.fabricsolutions.com.au/ for an easy and affordable way to line your pond. Finally, try improving your entryway with a few simple installations. Painting, placing a stain glass window insert and decorating can serve to boost the look of the entry. Remember, it’s the first thing people see when they enter your backyard, so make an impression! Window inserts are relatively cheap and can be found at most hardware stores, and installation is quite simple. 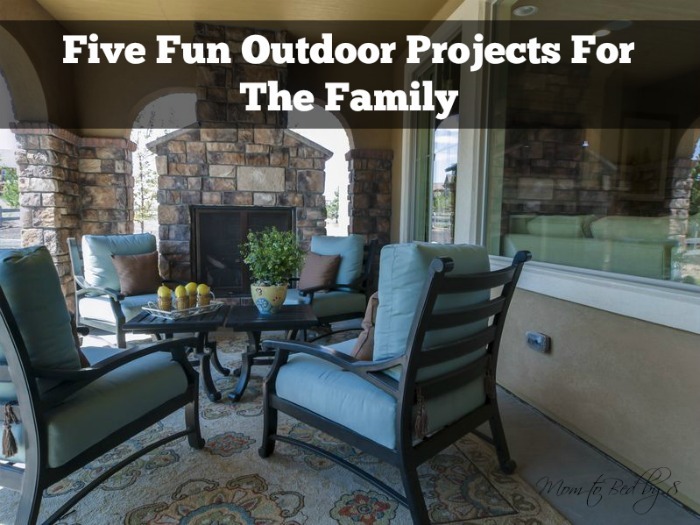 These projects will improve your home while you enjoy the simple pleasure of being outdoors. Get out there and build something!